Discussion in 'Sick Plants and Problems' started by Marie-jane, Jun 10, 2006. 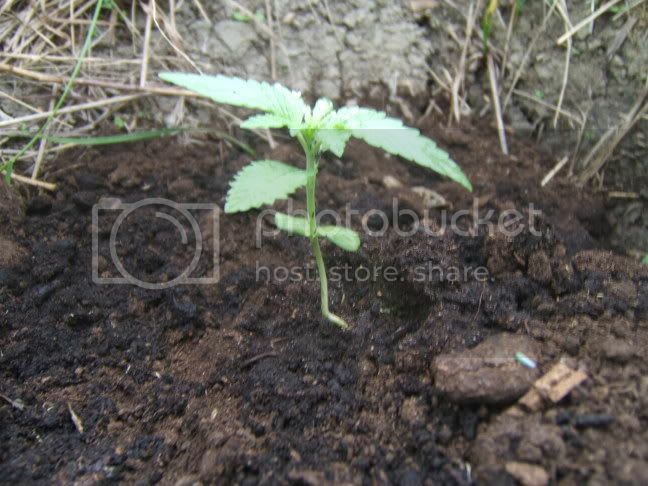 Im currently in my 2nd outdoor grow but this time im not having as much luck as last time at a week a half old there already getting eaten by something. I know its outdoor and there are lots of bugs do you think at this stage, it would be safe enouf to put pesticide just at this point in veg. I have in total 23 plants and this is only happening to 3 of my plants. its safe to use pesticides but have you chosen to use organic or chemical? looks to me like caterpillars/snail/slug and something else. Try crushing up lots of garlic in water and spraying that all over your plants, if the bugs return then you might want to go onto a stronger chemical pesticide. Would one of those be leaf miners Stitch? 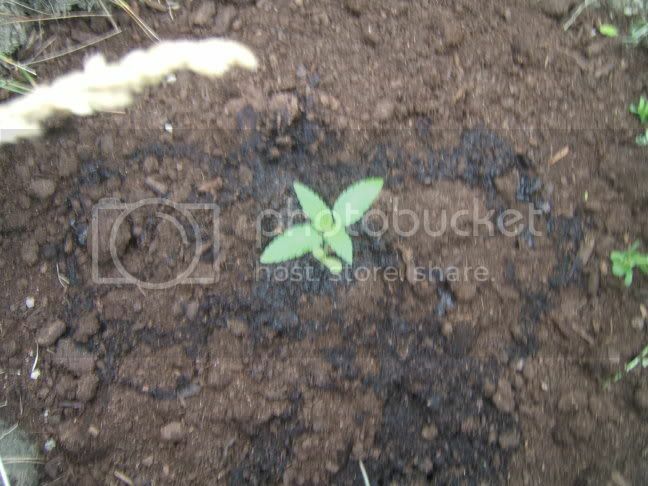 Went to the patch today and I found 1 snail and 2 caterpillars, so I killed them before they ''run away'' Plant are looking better but still a bit eaten anything else you guys consider using other than garlic or will it do the job? Check this out Marie-jane. It is from Stitch's guide. You probably have all three and I would treat for all of them. If you find caterpillars have been eating at your plants, garden and you need to get rid of them are several non-toxic and least toxic methods to choose from. Hand picking: Easiest way to control them is to pick them up and knock them into a bucket of soapy. If you are scared about handling caterpillars, you can use some gloves or have someone else pick them up for you. BTK in dust form can be used to kill caterpillars. BTK can also be used to foliar spray your plants. 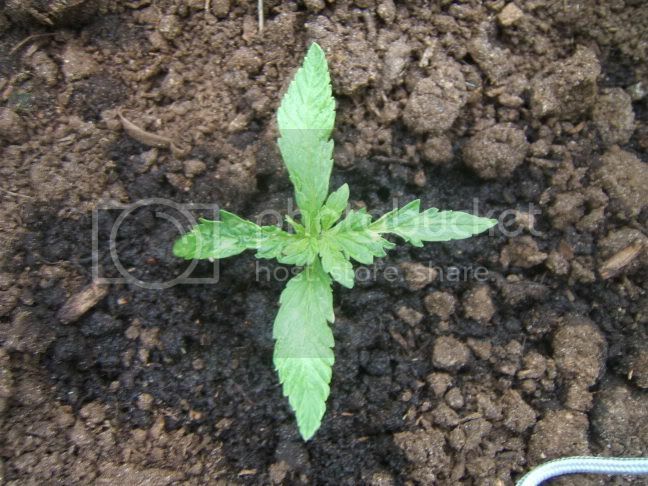 One tablespoon of neem oil added to your BT mix helps stick the mix to the plants better when you are foliar spraying.. BTK is available in liquid form. Apply BTK on all of the leaves both top and underside If you decided using the dust kind, spray your plants down with water before you apply the dust Apply every week to 2 weeks and or after it rains. The caterpillars must eat the BT as they are feeding on foliage in order for the caterpillars to be rid of. Insecticidal soaps, neem, oil, and spinosad are the safest insecticides that can be used to control.. Soaps and neem are non-toxic and are great to use when you have a lot of pets and want to be friendly to nature and its animals. 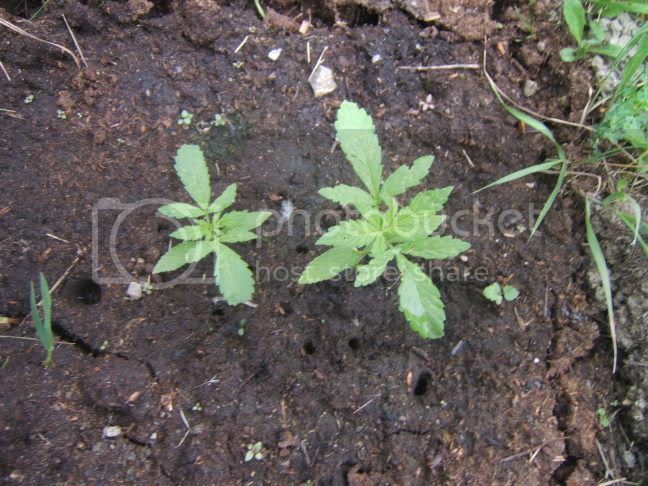 Spinosad works very good in controlling the caterpillar population and is non toxic to wild-life, pets, and humans. It hardly has any impact at all on the plants. Both slugs and snails travel by secreting a mucus or slime on which they glide. When you see the slime trail on your plants and have damage, then it was most likely caused by slugs or snails. When your garden is very moist slugs and snails can live for a long time as this is the key to them living a long time. If you keep your garden not as moist and dark slugs and snails cannot live as long. They stay away from the sunlight along with hiding around moist dark areas in the garden. They also hide in Mulches, short stubby plants, boards, and in the soil. They come out mostly at night and on cloudy days. They feed by chewing holes into your leaves and can clip the edges of leaves and flowers. Slugs and Snails are mostly pests of seedlings and herbaceous plants that are close to the ground. In order to confirm the damage was caused by slugs or snails, look for a silvery trail of mucous. If you do see any slugs or snails avoid putting mulches and dark hiding cover. Oak leaf mulch will deter slugs and snails. Put copper wire around your garden or at the base of your. Slugs get a big shock when they touch copper Just make sure you don't trap them inside your garden when you put copper around your garden. Beer is good to use, because slugs love beer!. Take a container of beer and bury it in your garden with it just barley above the ground so they can drink it and drown. Predators that like to eat snails include: snakes, toads, frogs, fireflies, predatory snails, birds, beetles. The large, black iridescent beetles you see in your yard are predators. Firefly larvae eat on slugs and snails and can literally wipe out the development of them by eating 40 to 60 snails from just 1 larva of a firefly!! These Little creatures are a pain to get rid of, the miners eat and dig squiggly lines into your leaves all the while planting there larvae in them making it hard to get rid of them. They plant there eggs in the leaves in mid When they hatch they feed off of your leaves until they get big enough to pupate. 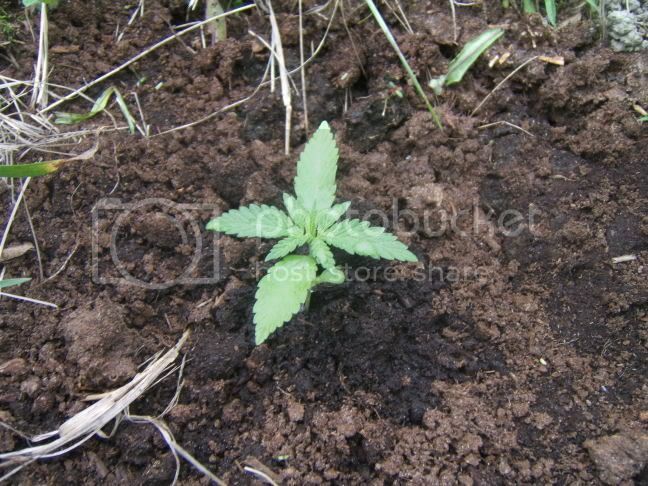 Pupation occurs within the leaf or in the soil beneath the plant. After they emerge the entire cycle will start over and you will have a bigger infestation. 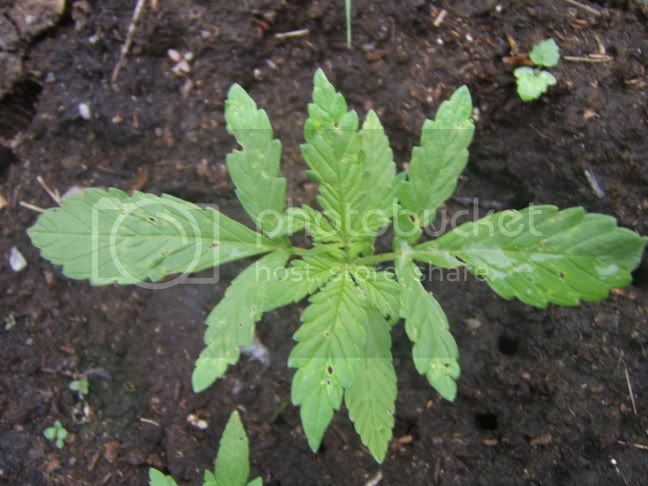 I really cant tell if thats holes in the leaf or burn marks. HIGH All, ahhh sure glad it's Frieday...leaf minors no....catapillers no...as Dier said they eat from the outside in....this is why I tell people to identify what yor pest is before useing anything...but hey our Buddy say's "What do I Know"...*LOL* you soooooo funny. What I think you should be looking into are Flea Beetles...have them on tomatoes every year. I use my fingers to kill them.....watch them though they jump just like a Flea. Yellow sticky traps work....but they (Flea Beetle) don't do much damage other than cosmetic looks. Identification is the key. Your best bet is the Yellow sticky traps. Unoit's vote out weighs mine. He knows better than me. Go with what he says, Dier too.